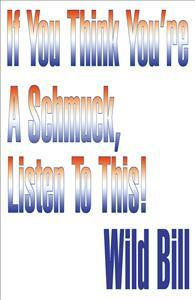 If You Think You're A Schmuck, Listen to This! My first meeting with Santa Claus & his dog Otto was in a bar at 9 yrs old. It was also the first time I had 7&7. My first meeting with Santa Claus & his dog Otto was in a bar at 9 yrs old. It was also the first time I had 7&7. I painted stolen cars with stolen paint in our yard with my Father. I was the first one on the block to have an electric horse. I set my toy chest on fire while locked in my room being punished. Christmas lists from friends to go shopping by shoplifting. Stealing tires from car lots. So many stories need to be told, because it is the reason Wild Bill is “nuts”.The stories go on and on and get better. For a first release and no previous experience, I think this is a good audio book. The stories are all true, yet you would not believe so, but you cannot make this stuff up. We know the some of the stories first hand. Have patience, and enjoy! Oh, and do NOT play this in the ear-shot of children due to strong language.